Tomorrow is the liturgical memorial of Saint Lucy, virgin and martyr of the early Roman Church who is among those mentioned in the Canon of the Mass. Lucy, whose name means "light", was a young woman from Syracuse, of Greek and noble descent. She was destined to be married to a young man, Pachasius, chosen by her own mother. 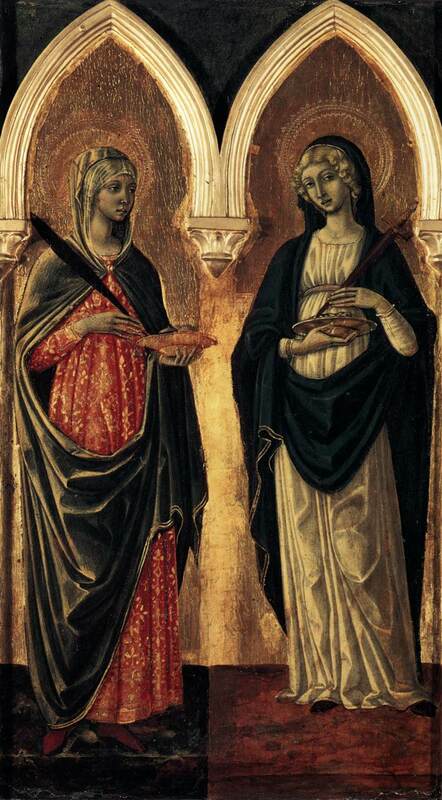 Lucy however was resolved to give herself completely to Christ and won her mother over to her cause only after having obtained the latter's cure from a long and painful hemorrhage through the intercession of the virgin and martyr Agnes of Catania (pictured with her above). The pagan bridegroom was expectedly furious and denounced him to the local governor who then ordered her to be turned over to forced prostitution. Just as no offer of reward or threat of punishment could move her, not even the strength of a team of oxen can bring her to the place where she would have lost the virginity she had offered to her heavenly Bridegroom. After many horrible tortures, including the plucking out of her eyes, she was finally condemned to be burned at the stake. And when even the flames refused to touch her pure body consecrated to Christ, a soldier was ordered to stab her in the throat. Thus she went to receive the palm of martyrdom and the crown of virginity from her heavenly Spouse, now beholden to her no longer earthly but glorified eyes. And so let us pray to Lucy, faithful Bride of the Lord, that she may grant us the strength to remain true to Christ no matter what the cost. In this Advent season, may the light of our faithful waiting for the Lord who is sure to come, like that of the wise and prudent virgins who kept their lamps alight, be our joy and consolation even as yet we await in darkness.